Heat oven to 425°F. Make pastry. Mix sugar, flour and orange peel in large bowl. Stir in rhubarb and strawberries. Turn into pastry-lined pie plate. Dot with butter. Trim overhanging edge of pastry 1/2 inch from rim of plate. Roll other round of pastry. Fold into fourths and cut slits so steam can escape. Place pastry over filling and unfold. Trim overhanging edge of top pastry 1 inch from rim of plate. Fold and roll top edge under lower edge, pressing on rim to seal; flute. Sprinkle with additional sugar if desired. Cover edge with 2- to 3-inch strip of aluminum foil to prevent excessive browning. Remove foil during last 15 minutes of baking. Bake about 55 minutes or until crust is golden brown and juice begins to bubble through slits in crust. Serve warm or cool. 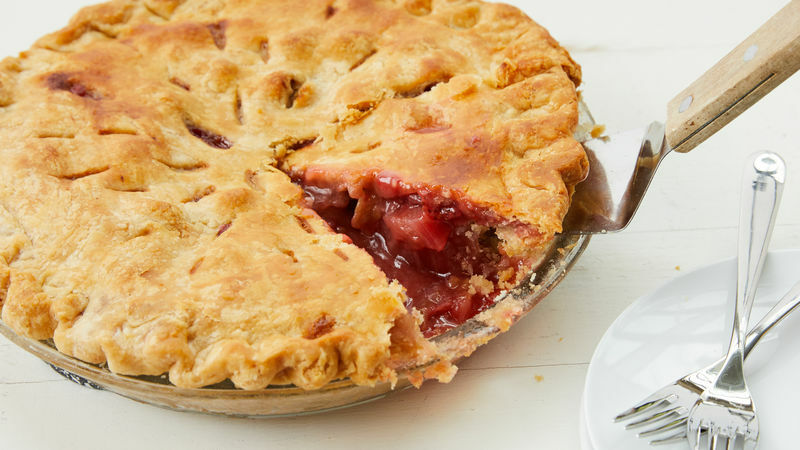 A 16-ounce bag of frozen unsweetened rhubarb, thawed and well drained, can be substituted for the fresh rhubarb.